Sea & Reef Aquaculture, LLC. What do you get when you combine art and science? The answer is DaVinci Ocellaris Clownfish from Sea & Reef Aquaculture. This gorgeous designer clownfish is a variant of Amphiprion ocellaris. The body color and general morphology of Sea & Reef’s DaVinci Ocellaris Clownfish are similar to that of the regular Ocellaris Clownfish, but the stripes are very different. The white stripes have been replaced with interesting curves and patterns - much like an artist painting broad strokes of white paint on a bright orange canvas. No two fish are exactly the same. The DaVinci Ocellaris Clownfish are a cross between our Wyoming White Clownfish (A. ocellaris) and Ocellaris Clownfish (also A. ocellaris). You might ask why we named this beautiful morph "DaVinci Ocellaris Clownfish". Well the hobby already have a Picasso Clownfish (A. percula) named after the famous painter Pablo Picasso. The name DaVinci was inspired by the famous Italian renaissance painter, scientist, architect, and pioneer Leonardo da Vinci. The DaVinci Ocellaris Clownfish combine the beauty of art and science. Sea & Reef DaVinci Ocellaris Clownfish grade extreme have 3 fused stripes on at least one side of the body. This grade has the most white markings. Sea & Reef DaVinci Ocellaris Clownfish grade A have two fused stripes on each side of the body. 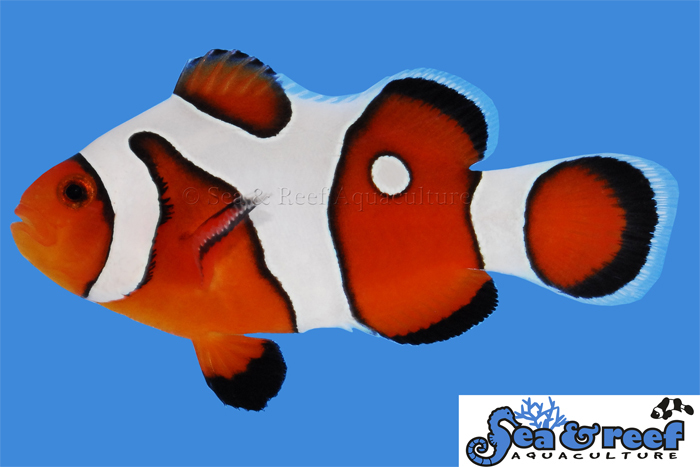 Sea & Reef DaVinci Ocellaris Clownfish grade B have soft wavy lines and all 3 stripes are distinct. Sometimes two stripes are fused in on one side only. Sea & Reef DaVinci Ocellaris Clownfish - each one is unique. The temperament and captive care requirements for DaVinci Ocellaris Clownfish are very similar to that of the regular Ocellaris Clownfish. It is relatively peaceful and hardy. They thrive in saltwater aquariums with or without an anemone present. Most clownfish are omnivorous feeders, meaning that they will consume a variety of different food types. In nature the diet of clownfish consists of crustaceans (such as copepods and amphipods), algae, polychaete worms, and leftovers from the anemone’s meal. Our captive bred fish are conditioned to eat a variety of aquarium diets including pellets, flake food, frozen Mysis shrimp, and frozen brine shrimp. DaVinci Ocellaris Clownfish will readily accept a wide variety of host anemones. As a reference, the natural host anemones of the regular Ocellaris Clownfish are Magnificent Sea Anemone (Heteractis magnifica), Giant Carpet Sea Anemone (Stichodactyla gigantean) and Merten's Carpet Sea Anemone (Stichodactyla mertensii).